The euro vs dollar continues to flirt with the neckline of the head and shoulders outlined in yesterday’s market commentary, ending the day on wide spread up bar which closed marginally above the 9 day moving average which has crossed below the 14 day. 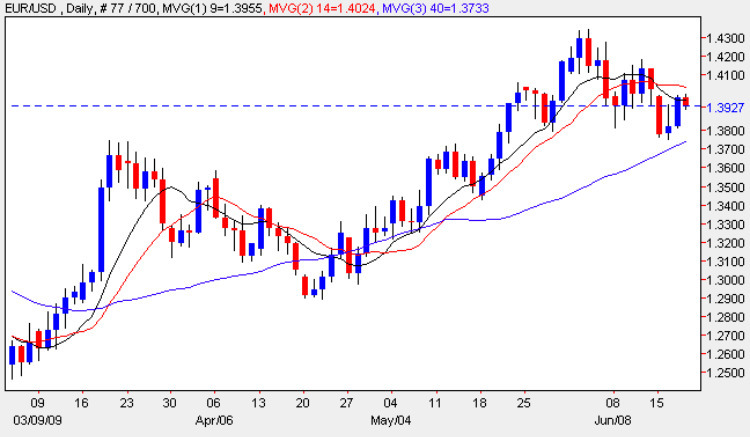 In itself this could suggest that the moving average may provide a barrier to any further move higher as the price is contained both by this and also the resistance in place at the neckline. With little in the way of fundamental news in Europe today but some significant items in the US, the overall direction today will almost certainly be dictated by the market’s attitude to the US Dollar, based on these news items. General anti dollar sentiment has been on the increase lately and its strongest expression can be found in the communique from the recent BRIC meeting in Russia where a new political bloc was formed in an attempt to end US dominance as well break the dominance of the US Dollar in the financial markets as the world’s leading reserve currency. Russia, in particular, is keen to have regional reserve currencies based on the Chinese Yuan and Russian Rouble. With regarding this pair at the moment my advice is to stay out until the neckline is either confirmed or the head and shoulders proves to be a false signal, which seems unlikely but as always we have to be patient.